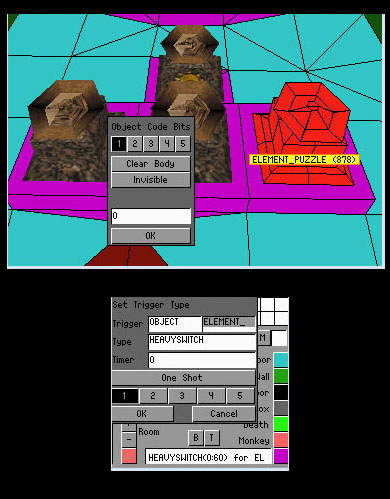 Element Puzzle is a single slot in the wad. 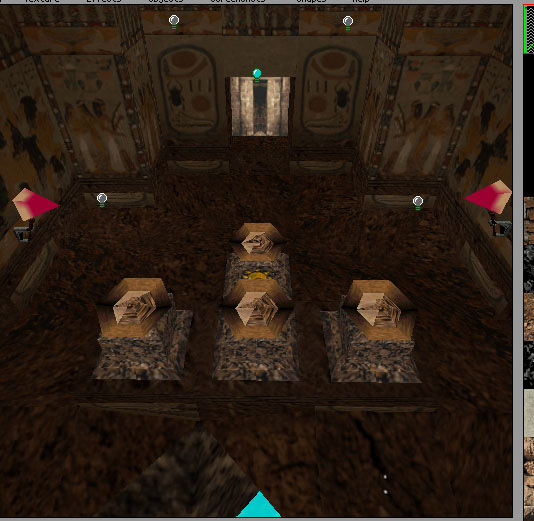 Different OCBs must be entered to create the four different versions of the puzzle. 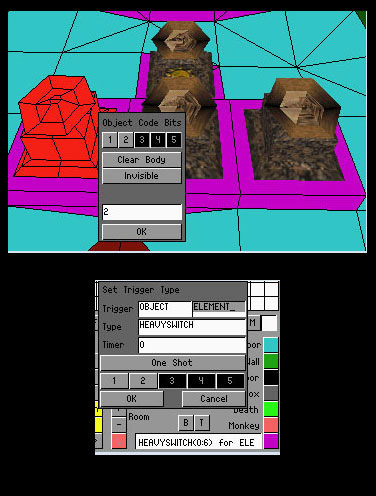 In the original TR4 Mastabas (joby4a) project four ELEMENT_PUZZLE items are placed to create the setup to open a door. The Mastabas level setup is described here. 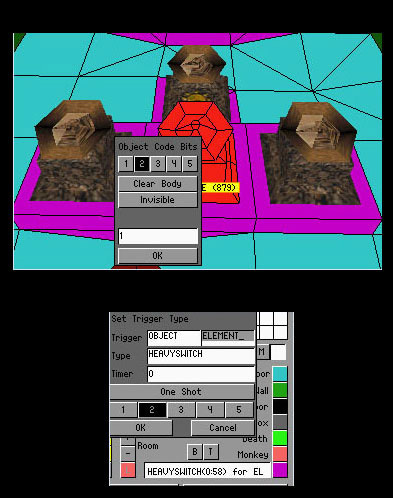 All items required can be found in the TR4 Mastabas level (joby4a.tr4 on the TRLR CD). Use WadMerger to add items to your wad. There are three visible ELEMENT_PUZZLE items, each one with a different symbol. The first one is blue waves and is referred to as water. Just fill your waterskin and pour the water onto the basin. The second one is a yellow sun and is referred to as fire. When you've got the jerrycan, pour the petrol onto the basin, then light your torch and make the petrol burn. The third one is a brown triangle, referred to as earth. Just use the bag of sand in front on this one. The fourth one is an invisible object that is used to trigger the opening of the door. 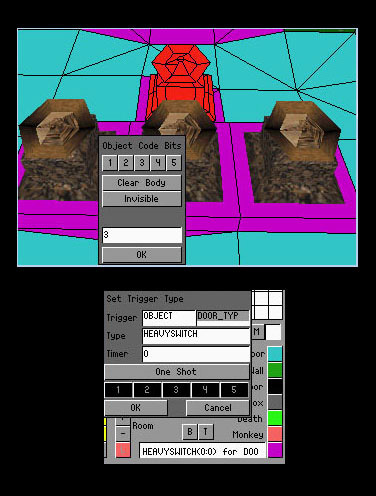 The three visible element puzzles combine to trigger this fourth element puzzle, which in turn, opens the door. Only WATERSKIN1_EMPTY, WATERSKIN1_3 items are required if you want to make a simpler puzzle of find water, fill waterskin and fill puzzle hole. Other waterskin objects are required if you want to make a 'juggling of water levels' puzzle. Add all the necessary items in your map (bag of sand, jerrycan, waterskin, burning_torch_item, available fire source). You can use less than 3 ELEMENT_PUZZLE items (for instance as in Bedazzled's Temple of the Stone where only the water part is used). When you place your triggers, don't forget that you should have ticked all Code Bit and Trigger bits when the ELEMENT_PUZZLE puzzle is complete. There have been reported bugs of savegames failing on reload when using the torch and then saving before the puzzle is completed. For TRNG users, apparently this bug has been fixed. I have tested this setup in NGLE with TRep, and the savegames appear to work correctly.